Nowadays, most people get their first taste of Texas Hold 'em by playing online poker from the comfort of their own home. While this is a great way to hone your skills and develop your strategies as a player, it does little to prepare you for the social realities of a live casino game. Fortunately, we here at Titan Poker are here to help. 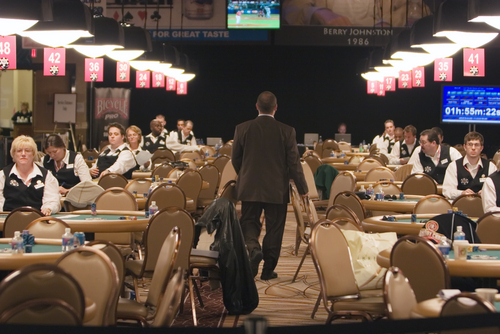 Whether you're hitting the cash tables at your local gaming house or heading to Las Vegas to participate in the World Series of Poker, there are a number of small things to keep in mind when stepping up to a live poker table, and here are just a few. For most first-time players, a trip to the casino typically means sitting at a live poker cash table. These tables involve static blinds and are possibly the best way to learn to play the game with a diverse array of opponents. Right off the bat, one thing all first time players should know is that the vibe at the table will be different than any friendly home game. That's not to say that people will be rude or unfriendly - though there is always that chance - but a casino setting lends itself to a more serious demeanor and players tend to abide by that. As such, be sure to avoid drinking too much, as there's nothing worse than an unruly player. The pace of play will likely be quicker than the games at your friends' houses, since there will be a dedicated dealer driving the action. These individuals will manage the flow of the game much as the automated dealer does in online poker portals like Titan Poker. Unlike the automated dealer, however, you will be expected to tip your casino dealer should the cards go your way. This is in no way mandatory, but it is considered proper etiquette at the poker table. Dealers will also be more stringent about the rules than your friends would, and that includes a number of things you might not observe in online play or at a home game. For one, you will not be allowed to discuss your hand while the action is in play. Dealers don't appreciate you providing information that could affect the outcome of the hand, as a smaller pot means fewer tips. It's also in poor taste to ask to see the turn or river cards should a hand not play all the way out, and most dealers will not do it. Another small thing to keep in mind is what to do with your chips. Do not loosely toss your chips into the pot, this is called splashing and it is considered disrespectful. Similarly, don't take any chips off the table until you announce your plans to vacate your seat. Also be sure to announce any and all raises, as dealers will treat any unannounced moves into the pot as a call. On the same token, be careful not to string bet (putting in some of your chips, before moving more), as dealers will only accept the initial amount put forth. Most of the time, people don't make the trip to a casino alone, and hitting the table with a group of friends poses its own challenges. For one, you won't all finish your games at the same time. Whether one person busts out quickly or there's a family emergency, someone will always be finished first - something that can be problematic if you carpooled together. If you're fortunate enough to be sat with your friends, you'd also do best to downplay your connections. As poker is a ubiquitously competitive game, you may end up locked in a serious battle with your friend. While these kinds of exchanges can be thrilling, good friends tend to have looser table talk - something that can set a contentious scene at the casino table, particularly if one or more tablemates are not doing too well at the time. Remember this is a more ardent setting than you may be used to, so keep as much of a professional demeanor as possible. Playing in a live poker tournament is a bit different than hitting the cash tables. For one, the style of play will be different because of the progressive blinds and antes, so the pace will likely be quicker than in cash games as players try to avoid getting hit with the blinds. Also be prepared for a number of unique rules, as many tournament directors will post unique guidelines for what can and cannot be done during the course of play. Should you find yourself on the receiving end of a losing hand, it's important to lose gracefully. No one likes a poor sport. That being said, it would not be in poor taste to shake the hand of the person who knocked you out. Of course if the tables are turned, don't pressure them into the handshake, as it is their call whether they feel up to the gesture or not.